Oracle Process Cloud Service applications can communicate and exchange data with external applications that are exposed as either REST or Web Services. In this first part of a two part series on connectors we will explore the Web Service Connector in Oracle Process Cloud Service to exchange data with an external application using the SOAP protocol. So let’s see how you can create a Web Service Connector in Oracle Process Cloud Service. The scenario will be quite simple. We will have a process that will invoke a publicly available web service, GeoIPService to lookup countries by IP address. The process will start with a form pattern, where the user will type in the IP address. The process will then invoke the GeoIPService, passing it the IP address typed in by the user and using a second human task, it will display the country where that IP address is. 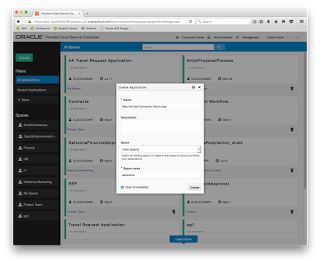 First thing that we will do is to create a new application in Oracle Process Cloud Service. I’ve named it "Web Service Connector Demo App" and created a new space (aantoniou) to file this new application under. Read the complete article here.